Another winner from the Contessa. Like Sam Choy, Ina Garten creates these great dishes using readily available ingredients. It is very unlikely that you'll find shoyu or sesame oil in the Contessa's cooking, but boy-oh-boy does she rock with just garlic, salt, olive oil and the occasional cheese or spice. 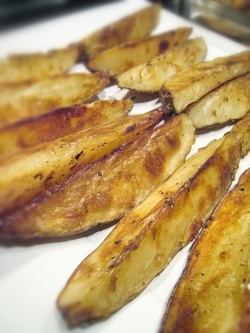 These roasted potato fries/wedges can be made on a weekday and have the same crunch/salt payoff of french fries, but without the "fry" part. And the garlic flavor completes it. As a benchmark, for those of you who know how much I love french fries that are absolutely drenched in catsup, I ate these as is. Wash the potatoes well because you will not peel them. Cut them in half the long way, and then into thirds. Doing the math, one potato will yield 6 potato pieces. Finely chop the garlic and set it aside. Divided the potatoes between 2 baking sheets or 9 x 13 pans. Drizzle with olive oil and toss until all sides of the potato pieces are covered. Sprinkle with salt and pepper. I like lightly salted and more peppery, but this is up to you. Sprinkle with garlic. Put potato pieces so that one of the cut sides (i.e., not the skin side) is flat on the baking surface. This is the side that will brown first. Spread them out and try not to let them touch. Tossing the potatoes with olive oil will ensure that they do not stick to the baking surface. Bake at 350 degrees for approximately 20 minutes. At this point the the side that is touching the baking surface should be getting a nice roasty, cripsy texture and lovely brown. When this happens, flip the potatoes so that the other cut side is now flat on the baking surface. Bake for another 20 minutes or until the 2nd side is nicely browned and a little crisped. Like french fries, these are best eaten fresh and hot.